Kappa (κ) chain is a 25Kd polypeptide that results from papain cleavage of the IgG molecule, encoded by the human immunoglobulin kappa locus (IGK) on chromosome 2. The subunit structure of IgG comprises 2 light chains and 2 heavy chains. Each light chain is composed of two tandem immunoglobulin domains: a) one variable domain (VL) and b) one constant (CL) domain. While the VL show considerable sequence diversity the CL shows internal homology with repeating units. 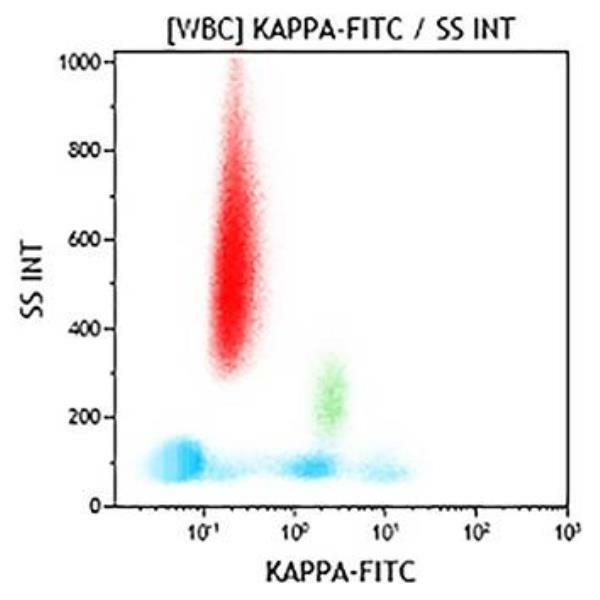 Anti-Kappa antibodies recognize the Kappa light chain of immunoglobulins expressed at the surface of a cellular subpopulation corresponding to approximately 2/3 of mature B lymphocytes in peripheral blood. This light chain is also found on the surface of a sub-population of immature bone marrow B lymphocytes.